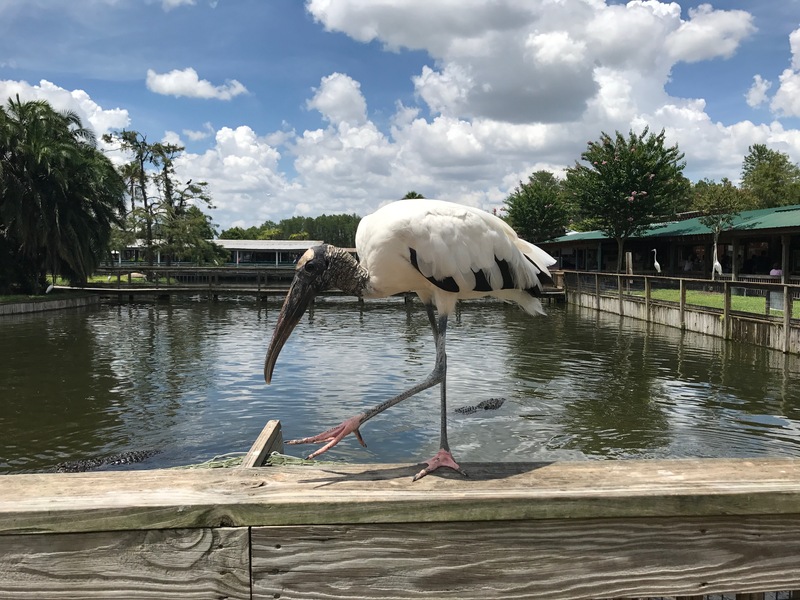 Believe it or not, my primary reason for going to GATORLAND was… the birds! I have seen so many truly wonderful photographs of the rookery there on several nature photography groups I’m in on Facebook so when I saw there was a half-price special for Florida residents, I packed up the kids and set off on a mini summer road trip. 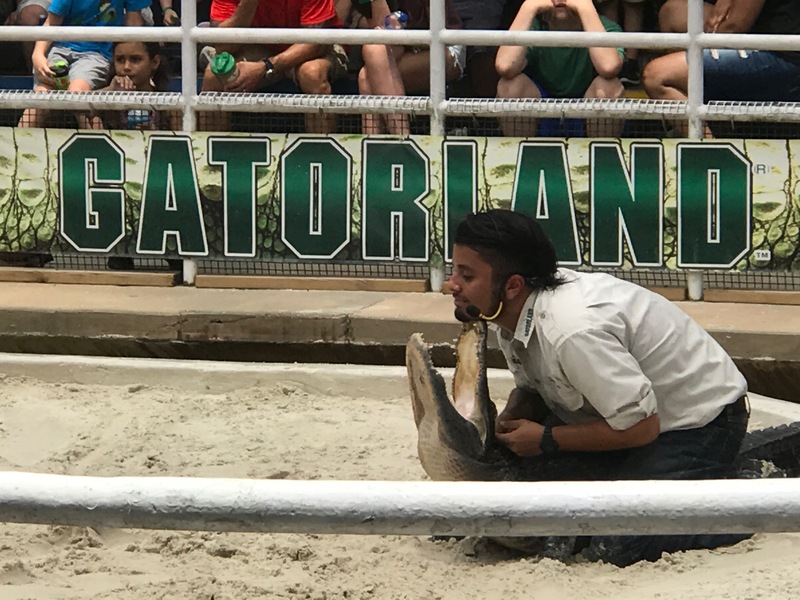 One thing we all thoroughly enjoyed about Gatorland was the humor. I should have known what I was in for when I pulled in to the parking lot with speed limit signs of 4.7 miles per hour. My kids read every sign in the park because they were all different and funny. 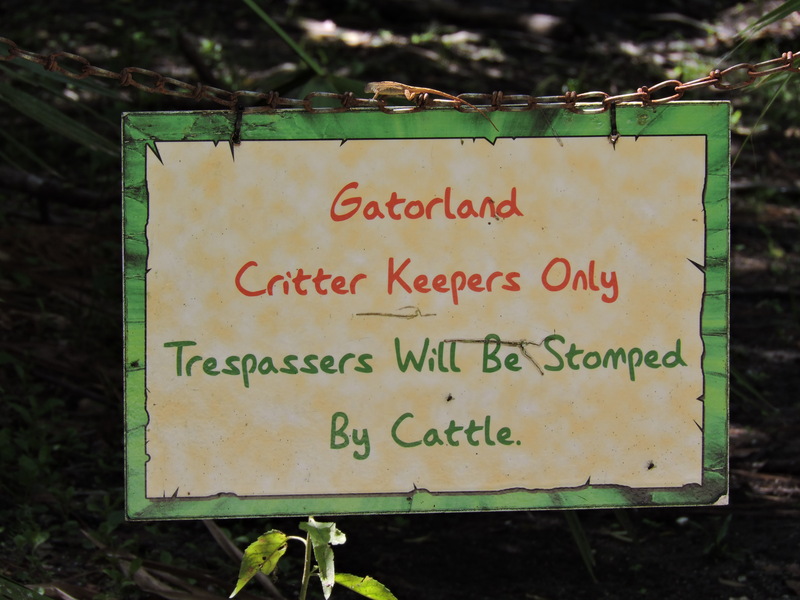 Gatorland really figured out that boring old DANGER signs everywhere would start to get old (and ignored) but the various jokes and threats were very effective. Also, the jokes of the train engineer and the banter of the guys who did the gator shows was humorously cheeky and the kids loved it. We thought the leucistic gator exhibit was very interesting – apparently they’re all really cranky so they have to be separated. And the aviary was well worth the $2 per popsicle stick of birdseed just for the looks on my younger kids’ faces as they gazed at these beautiful creatures on their hands. 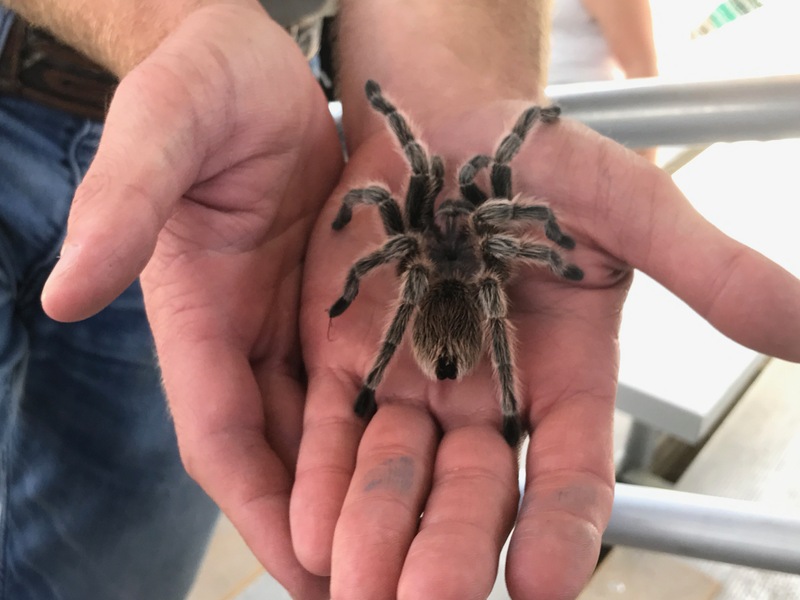 The goats in the Petting Zoo provided entertainment for all of mine as they enthusiastically ate the goat feed cones, and we enjoyed seeing gators at every stage of development from the baby to the morbidly obese adult…. although the dead gator with a missing front foot and cuts to its body and an abundance of flies could have been missed, but really, who can blame them for not wanting to be eager to get in that gator-infested swamp to retrieve a dead gator body? Sadly, both the python enclosure and the Swamp Walk were closed when we were there. I really love a good boardwalk so that was rather disappointing. I knew the python enclosure was closed for renovations but I didn’t see the Swamp Walk was closed on the website. Oh well! Then there was the rookery. Maybe it was my timing that was off. The kids were hot (duh!) and ready to find ice cream for lunch. Somehow they convinced me that hot dogs were too hot for lunch and they needed to cool off with ice cream instead. (Hey, I was alone with 4 kids, I’m totally outnumbered!) 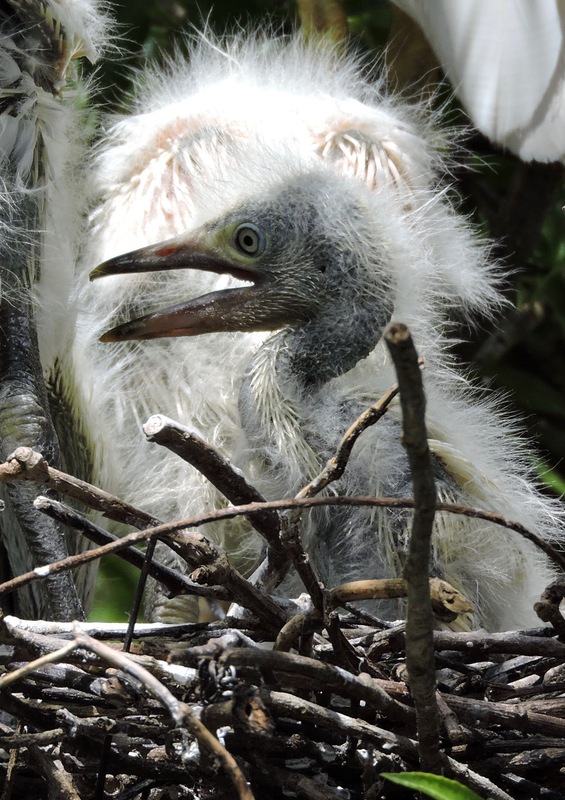 I did manage to admire a few adorably ugly egret chicks in the wading bird rookery and convince the kids to climb the observation tower. In addition to great blue herons, little blue herons, tricolored herons, there is an abundance of wood storks, cattle egrets, and great white egrets here. Or just “white birds” as ReaderGirl refers to them. Sigh. Really, the impressive breeding plumage, beautiful colors and chick behaviors are a pleasure to see. This rookery has 20+ species of birds – many endangered or species of special concern. I saw a few people with cameras that gave me lens envy. I assume they were there on the photographer’s ticket: they actually have a specially-priced Photography Pass for those who simply want to get there early or stay late on certain days to photograph the rookery inhabitants. Of course, we took advantage of the FL residents discount, which they cruelly offer in JUNE so needless to say, since it’s all outdoors, it was bloody hot. We actually heard the unmistakable THUNK of a lady across the pond hitting the (concrete) deck in a knock-out faint just before the Gator Jumparoo Show. The guys running all the shows also reminded visitors to HYDRATE with water (not soda) so I was especially persistent with my kid-who-tends-not-to-drink-enough. Apply and reapply sunscreen (I missed a patch on the back of my daughter’s neck after she put in a pony tail halfway through the day – mom fail!). This is Florida. Take care of yourself! There are lots of zip lines for the more adventurous, a water splash area for the kids, a little train ride for the tired (me! ), and the opportunity to feed “gator chow” (hot dogs) to the gators and crocs throughout the park. And they have some famous gator and croc residents. 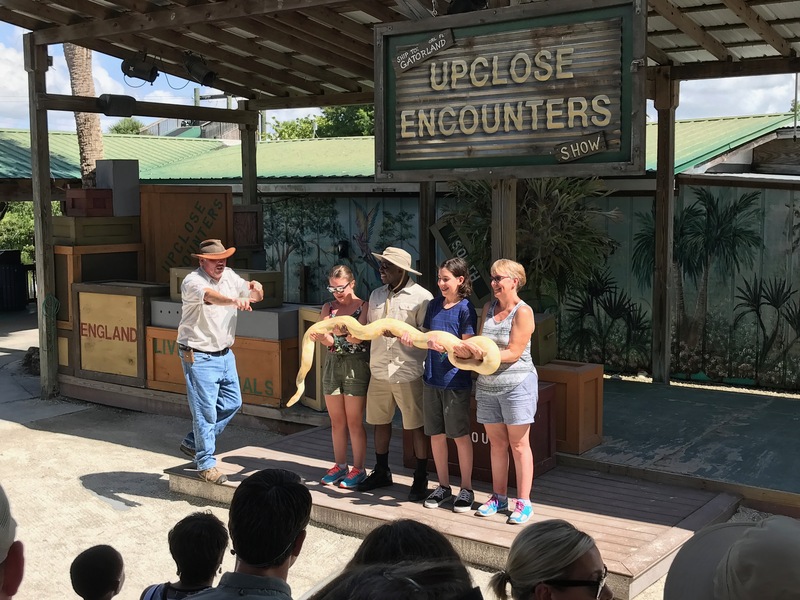 Not only can you see the undoubtedly aptly-named Bonecrusher II, an American crocodile who is absolutely massive but impressively swift when he sees hot dog bits being thrown his way, but you can visit Pops in his lonely enclosure. Pops used to be king of the swamp, according to the sign, and he’s been featured in numerous films, but he got himself demoted. He unfortunately figured out that he could shake the flimsy trees in which those bird-brained egrets built their nests (along the edge of an alligator breeding marsh) so that the baby birds would tumble down conveniently into his waiting jaws, much to the shock and dismay of tourists. 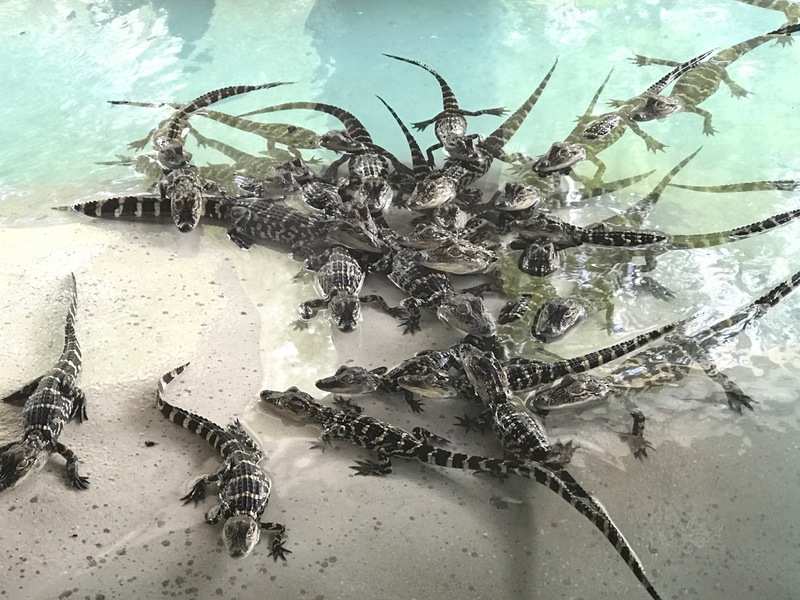 So he got booted from the swamp and now resides in a swank one-gator pool without all his many lady loves, far away from those delicious chicks.